← Why is USM More Powerful Approach Towards Threat Detection? It is needless to say that that the IT resources like the computer hardware, software and network are the ones which control the entire functioning of the businesses. Without these, the entire companies are more likely to come to a standstill. In order to keep them going smoothly, special planning and optimization are required, which not only improves productivity but also brings a sense of balance into the organization. Protecting the IT resources is the prime responsibility of the company, and this is where VRS Tech steps in. We provide AMC for computer hardware and network infrastructure for small and medium-sized companies to enterprises across UAE. Why is Annual Maintenance Contract essential? AMC for computers is not just another expense; with proper planning and execution, it could be a smart investment. This is all the more reason to choose the right provider of the AMC for computers, just so your IT equipment is in the right hands. How does Annual Maintenance Contract Work? Unlike the usual belief, you need not shell out a lot of money for and AMC. In fact, it is a cost-effective strategy to protect your IT resources well in time by paying a nominal amount as an annual payment to cover all the features listed below in order to avoid productivity loss. AMC is a foolproof way to run businesses: By acting in a timely manner, employers can avoid any productivity loss whatsoever. Regular maintenance at timed intervals can not only avoid the breakdowns, but the AMC also helps in getting the IT failures fixed in no time at all. Stay in touch with the latest technology: Any technology is most likely to become obsolete in a few years. AMC helps you to stay ahead of the curve from letting it happen. Through regular updates and bug fixes, and saving the IT equipment from facing the downtime; you can extract the best of the abilities of the employees. Invincible Customer Support from the provider: To us, the businesses seeking the AMC contract with us, are given the highest priority. 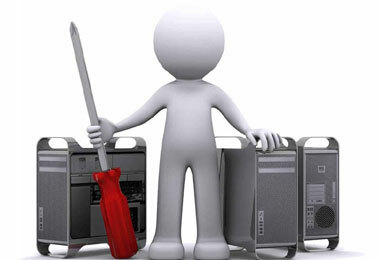 We offer 24/7 remote and on-site customer support from system glitches to network breakdowns. Best Security round the clock: Through AMC support from VRS Tech, we deploy only the best security measures to ensure complete security for your network and computer hardware. Contact VRS Tech at +971-56-7029840 for Annual Maintenance Contract for all kinds of businesses in Dubai or visit our website www.vrstech.com for more information.